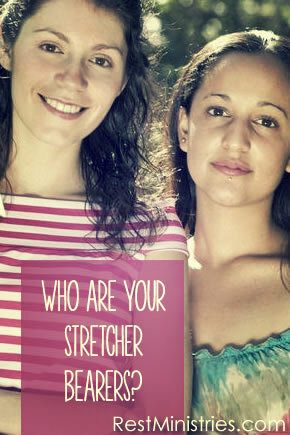 Who Are Your Stretcher Bearers? Some days we are unable to carry our own stretcher and we rely on the faith of those around us. Bronlynn shares. “Since they could not get him to Jesus because of the crowd, they made an opening in the roof above Jesus and, after digging through it, lowered the mat the paralyzed man was lying on. When Jesus saw their faith, He said to the paralyzed man, ‘Son, your sins are forgiven’” (Mark 2:4,5). I recently finished a book on the life of Jesus called The Way by Adam Hamilton. The chapter on Jesus’ healing ministry referred to the story of the paralytic whose friends lowered him through the roof to be healed. The passage doesn’t say it was the paralytic’s faith that healed him. Rather, it says “their” faith–which may have included the paralytic himself–but certainly included his friends. This man’s friends had faith enough to do whatever it took to bring him before the Lord. They carried him, and they were not discouraged by the obstacles in their path. They dug a hole in the roof and lowered him right in front of Jesus. Do you have any stretcher bearers in your life–people who have expended effort and time to carry you either literally or spiritually through your health challenges? I do, and I thank God for them. During my worst season physically, mentally, and emotionally, I asked my mother why things weren’t getting better if people were praying for me. I made it through those agonizing months due, at least in part, to the faith and support of my stretcher bearers. They carried me before the throne of grace when I lacked the faith and ability to carry myself. And they continue to do so. Not only do I have stretcher bearers, but I can be one. Although I am not physically able to help these people because of my own health issues or distance between us, I can pray for God’s strength, comfort, and healing, believing in faith that God will carry out His perfect will in their lives. Praise God for the stretcher bearers who carry us! And praise Him for the blessing we have of carrying others. Prayer: O God, thank You for the stretcher bearers in my life who have carried me to You in faith when I have been unable or unwilling to carry myself. Bless them, Lord. Show me how I can be a stretcher bearer to others, even through my own weaknesses, and give me the strength and desire to do so. Amen. Who are your stretcher bearers? Take time to thank them and thank God for them. Are you a stretcher bearer? If not, ask God to show you how you can meet that need for someone else. Filed Under: Coping Skills, Devotionals, Friendships, What's New? 3 Responses to Who Are Your Stretcher Bearers? Bronlynn – thank you for your prayers for me over these years! Truly, our online friends who we have not met in person but with whom we share our needs, are wonderful in lifting up us and our needs – and understanding them. I am missing my Mom on this Mother’s Day for, much as you say about your mom, she was with me through some of my darkest times and was such a comfort. A blessed Mother’s Day to you! Thanks Lynn. I can imagine how much you must miss her – I know I will be the same way when my mom goes “home”. But I also know I will have stretcher bearers to carry me through that too :). I’m in catch up with my emailed devotionals & am thankful for this wonderful reminder of my stretcher bearers. Some are those who are tangibly there for me & come & do things to care for me & my family. Others are those who pray daily for me in their quiet way & whom I only know that about them through someone else!! I’m soooooooo thankful for those special people that bless me in ways I know about & ways I don’t!